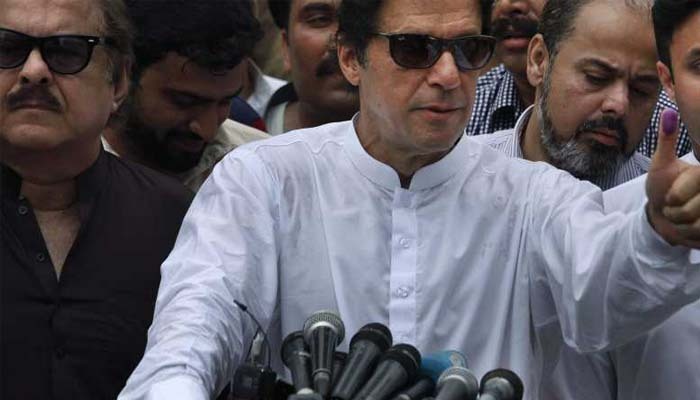 ISLAMABAD: Pakistan Tehreek-e-Insaf (PTI) chairman Imran Khan said that he was ready to investigate allegations of rigging in the parliamentary elections. "Anyone who has issues of rigging; we will help you facilitate and we will open up any constituency that you want for investigation. When we asked for probes, we were not facilitated but now we will do it differently,” Khan said in his address to the nation on Thursday after his party appeared to be in a position to form a coalition government. "I will have every contested constituency’s ballot papers re-opened and re-counted on demand whichever constituency is contested, PTI will support the investigation," he said. Khan lamented that he had not been supported by the same parties when he was demanding a probe into the 2013 general elections. “This is most free and fair election in the history of Pakistan,” he said. His offer came as five major political parties, including PML-N, PPP, JUI-F, MQM-P and PSP, have suspected foul play in the elections. “We rejected the election’s results,” PML-N President Shehbaz Sharif said yesterday after the poll. Speaking late night press conference, PML-N Shehbaz Sharif said he had not seen such post-polling situation in his entire political career. PML-N President said they have received complaints of not providing form 45 to our polling agents and also our polling agents were expelled in D.G Khan. PPP leader Taj Haider also joined the protest claiming that copies of Form 45 were not handed to the polling agents which should be done under urgent notice.